Easter is on its way along with the spring and so is the preparation and decoration. From the traditional to unexpected, the Easter decoration ideas and designs have come a long way and today people are using designer eggs to decorate in the form of basket, table top, seasonal display, etc. Rather than using usual egg dip dyeing route, people these days are trying Easter egg that is unique. 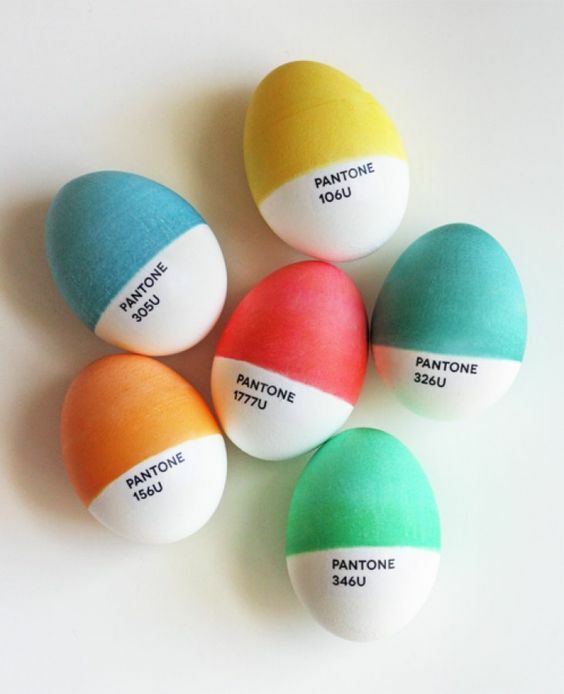 Dye the eggs in Pantone’s colors of the year and take your egg decoration to another level. Dye the eggs by keeping them vertically in small cups of dye, type the labels and print them on ink jet temporary tattoo paper backwards. Give your eggs a dandy accent by dressing them with mini handle bars. 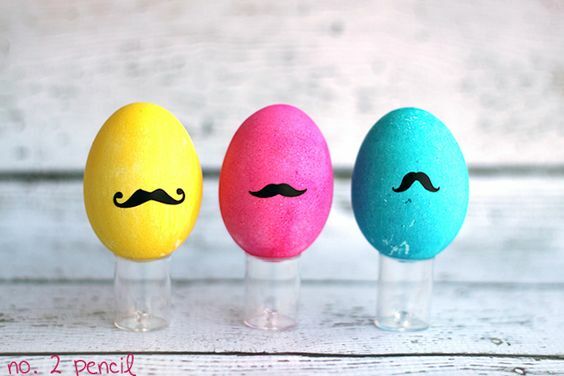 Decorate them with little mustache in different styles to impress your guests. This is a 5 minute DIY idea which does not require any artistic ability and will turn out elegant every time you make one. For a festive look, using sprinkles is not too hard and is highly suggested. For this idea, all you will need is non pareil sprinkles, paint brush and tacky glue. 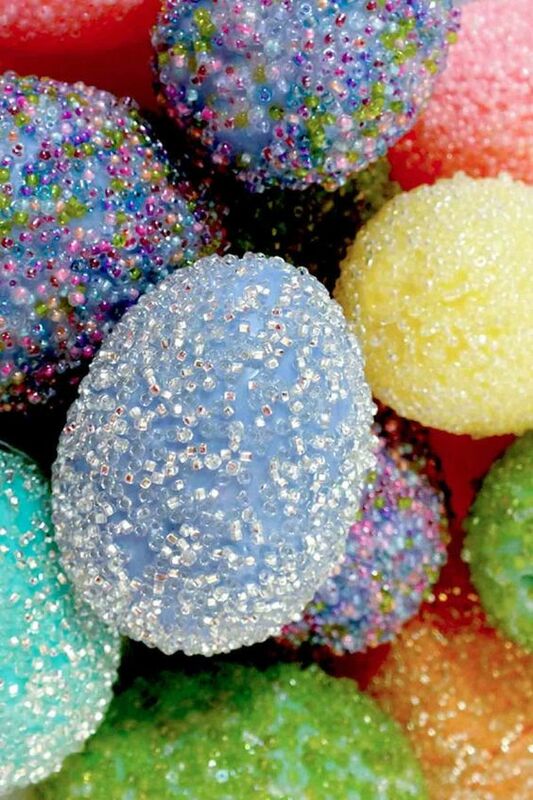 Simply paint the eggs with glue and cover them in sprinkles. Press the sprinkles on the egg after covering it so that it sticks well on the egg. 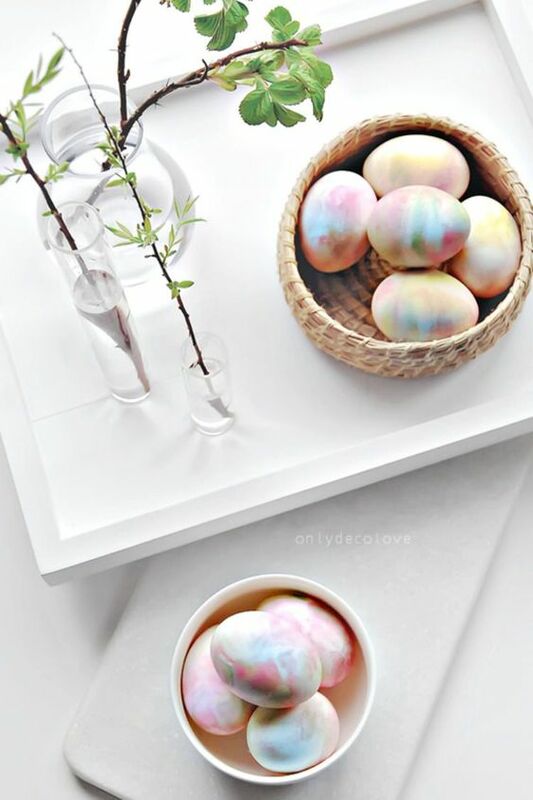 For your Easter dinner table, dress up the store bought egg with plastic or glass beads in spring colors to increase the beauty of eggs and also your dining table. 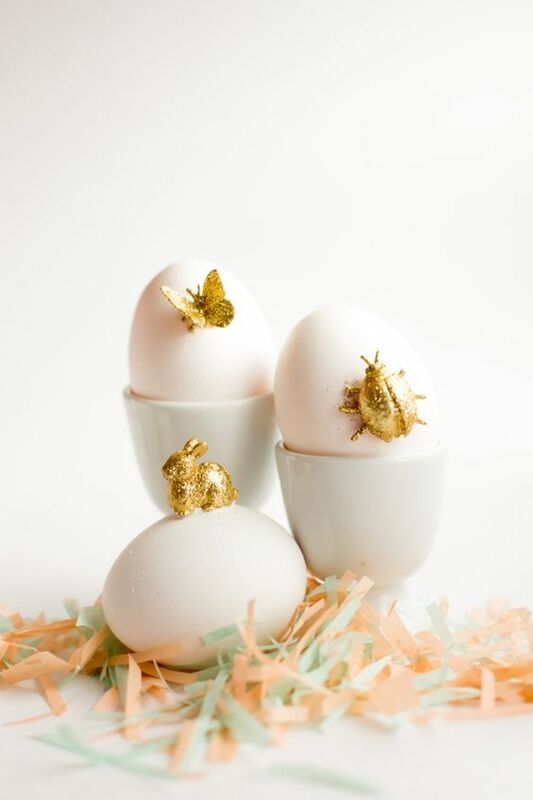 The golden leaf eggs are a beautiful glitzy take on the festive season and a classy alternative to your colorful, standard egg. 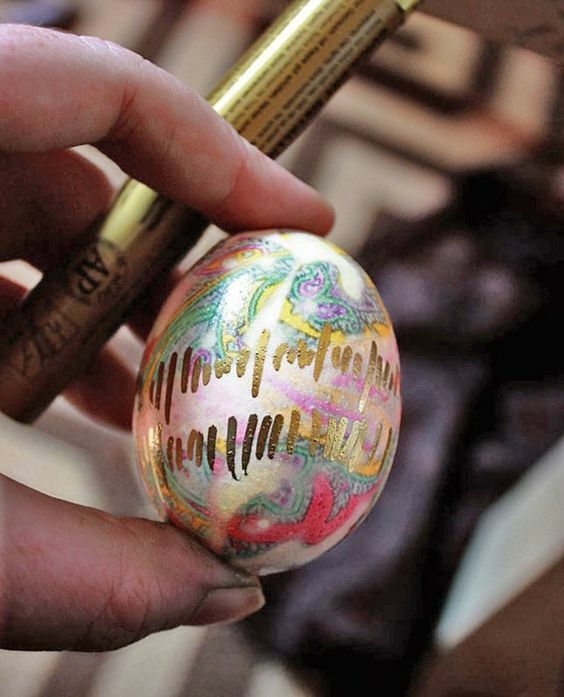 The gold leaf on the egg is a real bomb which makes it sophisticated and beautiful. You can try leafing in different colors like rainbow, Turquoise, Red, Silver, Copper, etc. This idea will help you avoid messy dyes and paints. For this decoration, you can use sharpies to create colorful designs. Decorate and look at the end result coming out as a master piece. The genuine and genius mixing of yellow and blue plastic eggs will instantly create the charming movie stars which will make both kids and adults fall in love with it. It is one of the most easy to make décor idea in the list. 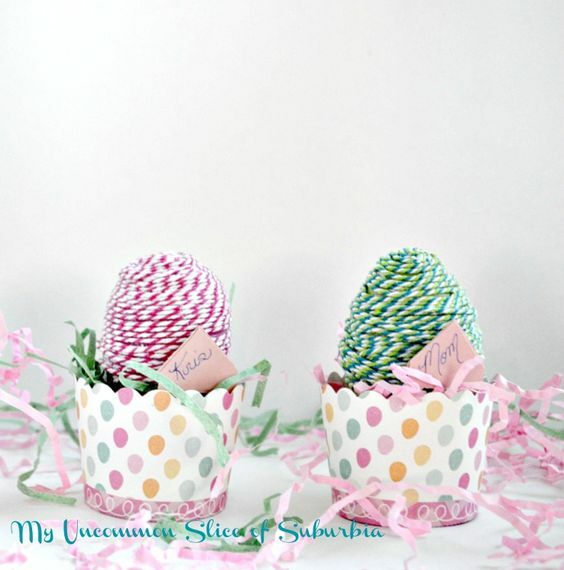 For crafting the egg with this idea you will need mod podge, Easter egg and colorful twine. 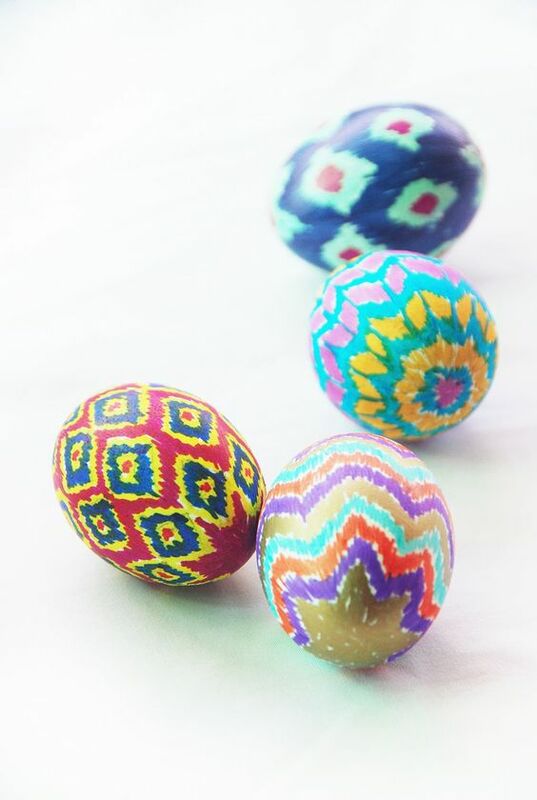 You can use wooden eggs or hard boiled eggs to keep up the craft whole year around. Simply coat the eggs in mod podge and wrap twine around it. Use color combination of your choice and give your décor a unique look. 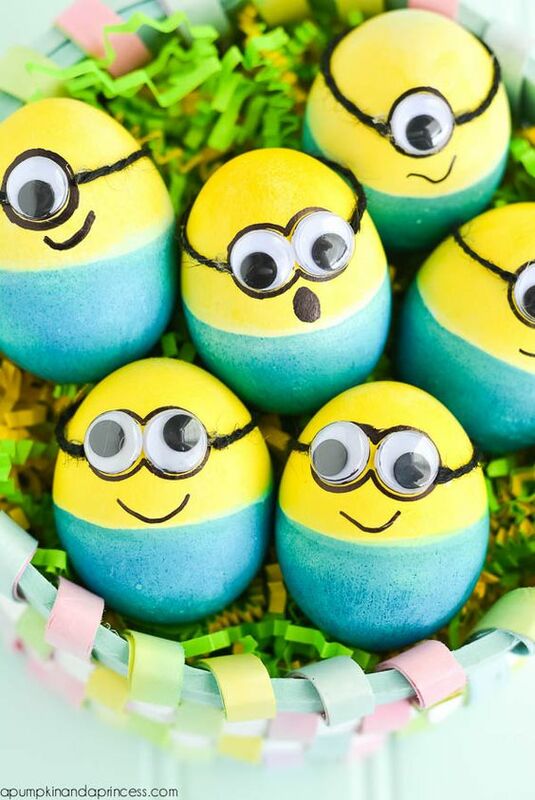 Involve your kids to decorate the egg with this idea and witness zero chances of your kids messing it up. If you or your kids do not like any design then simply erase and start again on the same egg. You can write anything you wish on the egg and have a great place setting. 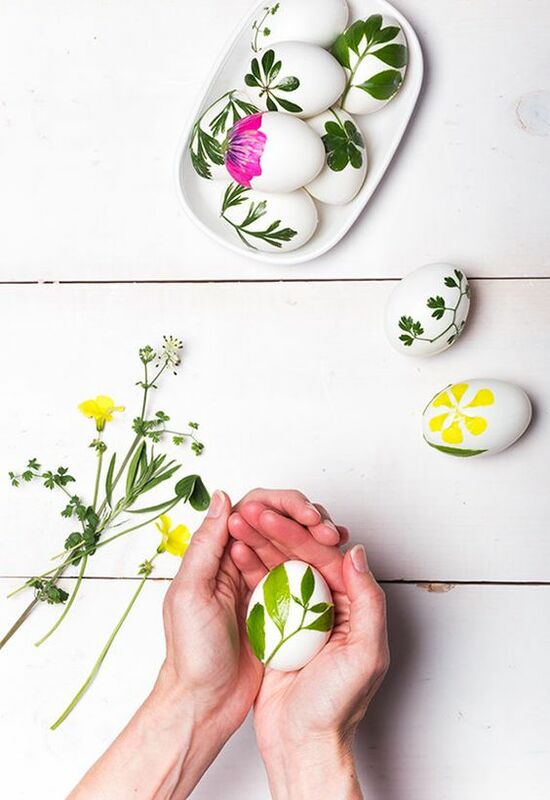 Use vinyl or stickers on a hard boiled egg for creating crisp lines and designs on the egg and sharpie to make little dots around the design which will give them a beautiful look. It might look difficult to make but the end result will definitely amaze you. You can include your kids in the idea and increase their decorative skills level. The teens in the house will definitely love this design as they are fond of expressing themselves all the time using emojis. Why not, you also try the same this season and express yourself with the same? With this DIY idea, you can include teens in the house for decorations. 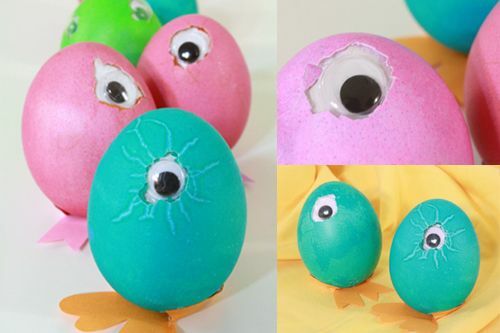 If you have got one or few imperfect egg then do not throw them off, rather press a googly eye in the crack and turn it in to a so – called scary mythical creature looking egg. 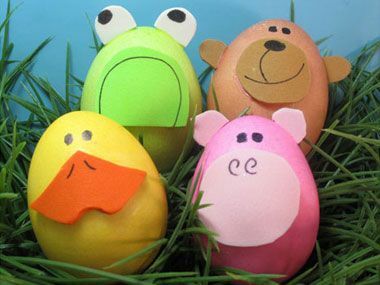 Create an easy egg animal using colored as well as white foams. Make the faces of animals and decorate it at your favorite place. You can create a frog, a monkey, a pig, a chick, etc. For this idea you will need some help from the dollar store to buy some toys and gold paint. The teeny treasures will give the eggs a perfect expensive look. The design on the egg is whimsical yet simple and clean. This is one of the latest and a trending way to dye the eggs for Easter decoration. Using old silk ties make an ornate seismograph and your design is good to go on the center table as a beautiful center piece. For creating the water colored looking eggs at your home as a DIY you need not be a professional in painting. 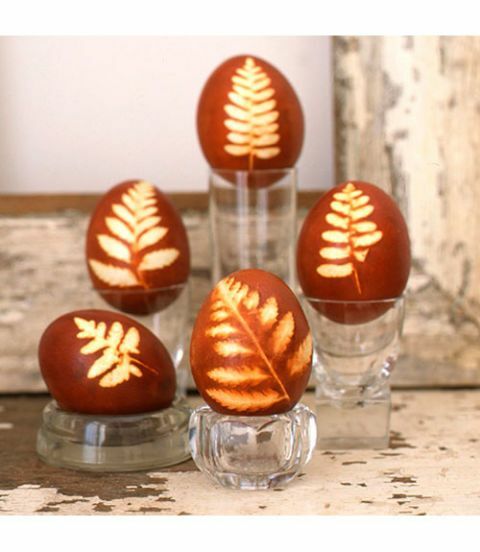 Use whipped cream and you are good to go to create these beautiful decorated eggs. Washi tape is a secret weapon of crafter’s pop of color which looks incredibly elegant on white eggs. Use washi tapes and play with patterns by cutting the tape in various shapes. Try this elegant idea using pom pom and card stock or a white foam. Make a bunny and its carrot and use it for decorating the center table. On few white eggs, simply apply your favorite florals and plants to create small master pieces which you can use on the center table. If you are fond of art and especially abstract art then this décor idea is definitely meant for you to try this year. Bring out your color supplies and create the simplest abstract design of your choice. You can also ask your kids to join in and create some of them. The space inspired eggs design featuring layers of brushed on and splattered paint makes them a beautiful work of art and something which will definitely be loved by kids. Allow the nature to dictate the design on your eggs using yellow onion skin, small fern fronds or leaves and vinegar which will leave leafy imprints on your eggs surrounded by a deep sepia brown color. Fill a glass bowl with glitter dotted eggs for sparkling center piece. 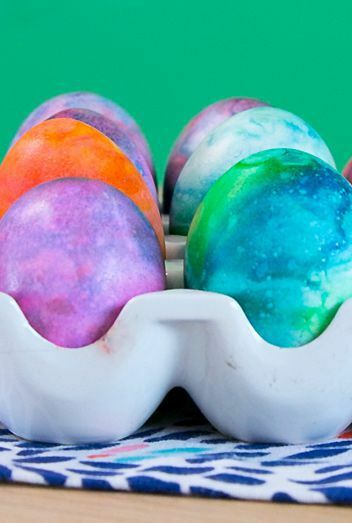 Dye eggs in desired color and let it dry. Once done, squeeze different size of circles of glue on the egg and then glittering glue over the egg. BLOTTED EGGS: No one in your house will be able to guess the secret tool which makes it easy to create this unexpected and unique bold texture on the eggs. The secret behind this design is a Paper Towel. 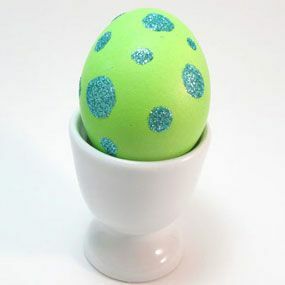 NAIL POLISH EGGS: The adorable decorating idea depends on the dunk and color technique using nail polishes instead of food dyes to get the variety of shades, shapes and designs. COTTON CANDY EGGS: Use cotton balls in pink and blue paint along with gold glitter to give your Easter décor a wonderful spring time. Dress up the eggs in a little faux cotton candy. It is as easy as less time consuming. CUT OUT EGGS: To cut forms from painter’s tape, use papers punches and smooth the tape pieces on clean white eggs and dye them. Once done, let the eggs dry and remove the tape to reveal the beautiful white patterned design. 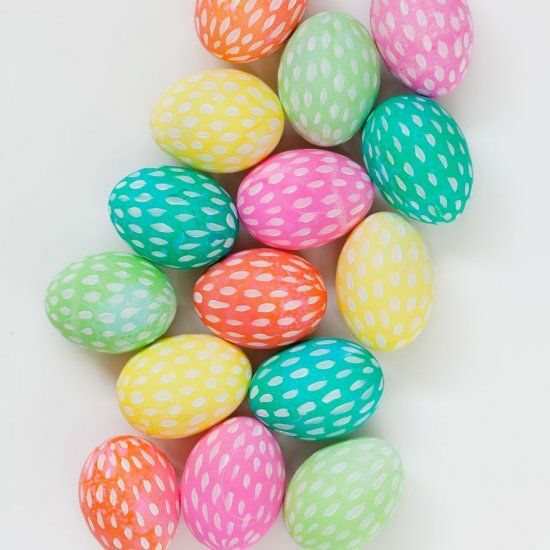 PREPPY EGGS: Glue some grosgrain ribbon around dyed eggs using glue on the ribbon first and then laying the egg at one end of the ribbon and roll until ribbon encircles the egg. KOOL AID EGGS: With this design idea, allow your kids to get a little messy and work on their creative skills. Help kids to bring their talent out on eggs using their favorite fruit drink. Do not worry about any clean up because it is easy. BALLOON EGGS: With the most common party element, make Easter celebration a little more fun. Dye the eggs in your choices of colors and then attach a similar colored balloon knot. In simple words, stuff the dyed eggs in the same colored balloons. METALLIC EGGS: Increase the beauty and the glam factor of the eggs by using silver, bronze and gold colors on the eggs. 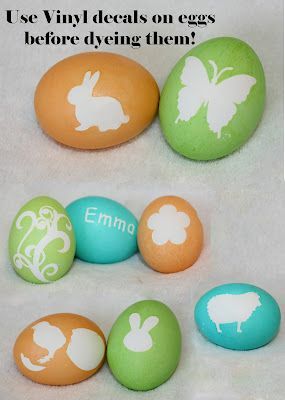 Use spray paint colors and color the eggs in few coats. 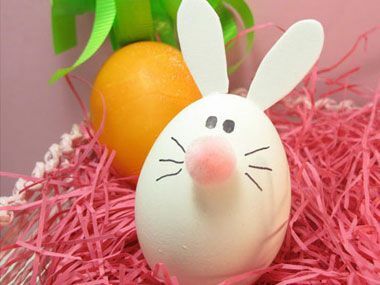 Once the eggs are fully dried, decorate the eggs using a Chalk Marker as it will provide you with a clean matte colored lines. PHOTO EGGS: For this design idea, you will need a print out of your photos which you would like to show on your eggs. 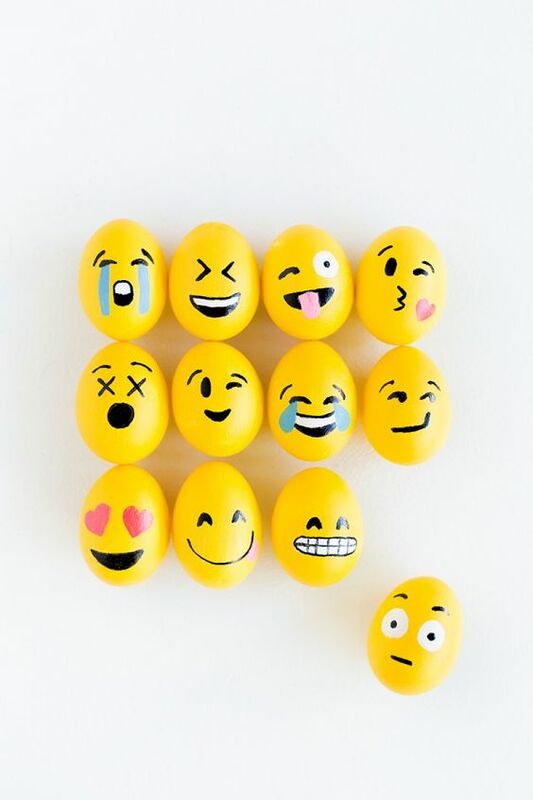 Dye the eggs and apply trimmed images on the eggs and display the end results proudly to everyone. TIED FLOWERS: If you do not want to create too much of a mess then this idea is for you and also your kids. Simply nix the dye and use baker’s twine or a string to secure the herbs to the eggs and flowers. You can use violet buds, forsythia, rosemary, thyme, etc for a hint of fragrance for this Easter egg idea. MARBLED EGGS: The design idea will not only impress everyone but make them fall in love with the eggs. Make sure you make some extra as Guests would ask you to gift some of the eggs to them. The marbled egg can be created in any color but deep blue eggs in particular will steal the show. 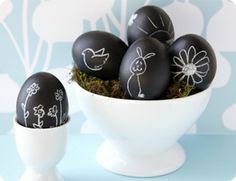 BLACK AND WHITE EGGS: For this decoration to implement, you will need some office supplies like a black sharpie to create this black and white chic craft in the bold graphic of your choice. ICE CREAM CONE EASTER EGGS: Design and watch out as your kids fall in love with these flavorful ice cream eggs. Paint the egg in tan color and the top of the egg in other colors to get this beautiful designer ice cream egg. YARN WRAPPED EGGS: It is as simple as the name states. All you have to do is to wrap the blown eggs in spiral of colored yarn, ribbon or rickrack with clear drying glue. TATTOO EGGS: It will be hard for the house members and the Guests to not fall in love with these cool looking eggs which are not dyed but just designed with fake tattoos to eggshells the way you would to your own skin. Rather than bright colors, get the eggs stamped with super heroes, spiders and other tattoo designs. EGG TOPIARY: Made from paper napkin covered plastic eggs glued on Easter grass covered Styrofoam cones, feather your nest with topiaries. This is one of the trending design ideas this season. The best thing is that in this idea, you can play with the elements. MOSAIC EGGS: Now rather than crying over a broken egg try some innovative mosaic craft to create something which you can call out of a shattered shell. For this idea, you will need food dye and white vinegar. CACTUS EGGS: Not only you but also the guests will be hard pressed to find a more creative Easter egg decorating idea than this, which has the white mini terracotta pot to the card stock extremities. GOLDEN WREATH EGGS: Hang the gold plastic eggs using an embroidery hoop and yarn and have a beautiful wall hanging. BURGER EASTER EGG: It is a clever nod to one of your favorite fast food. You do not have to dye your eggs for this idea; rather you can use hardboiled brown eggs. You can also create French fries and other food items as well. 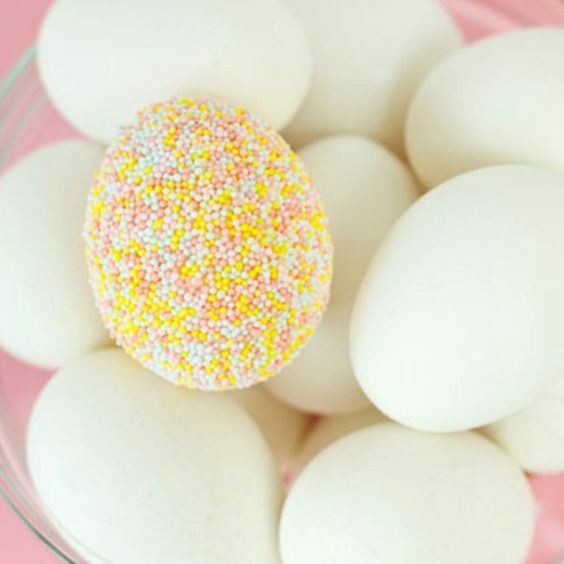 SPECKLED EGGS: The speckled eggs embraces the spring time color palette just like their candy counter parts in this design idea. PINEAPPLE EGGS: For this idea to implement, all you will need is some yellow paint and green colored card stock. It will look as amazing and real as an original pineapple. GEOMETRIC EGGS: The beautiful eggs are made out of wood which makes them capable enough to get displayed year after year without any cracks. 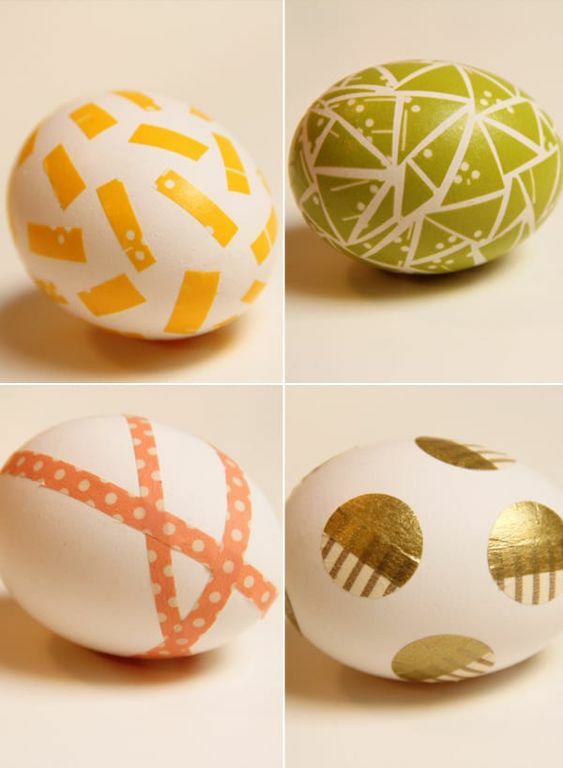 Do the geometric paint job on the eggs and you are good to display your skills. BABY BIRD NEST EGG: You will have to be little careful with this idea. The elegant egg nest ornaments do need a gentle touch to craft but the final result will definitely surprise you. CHOCOLATE EGGS: The chocolate eggs can be used year after year because they are not the real ones; rather they are the plastic eggs which have been covered in chocolate brown spray paint. STONE EGGS: For this idea, all you need to do is a coat of stone spray paint on some regular plastic eggs to create an expensive look. GUMBALL MACHINE EGGS: This is something totally different and whimsical which you can try this year for your decoration. You can try to make a wee candy dispenser using red paper and colored sharpies. FOLKS! Here ends our trending list. Watch them and try them out. You can mix 2 or more ideas to create something more unique this year and do not forget to use your own ideas.